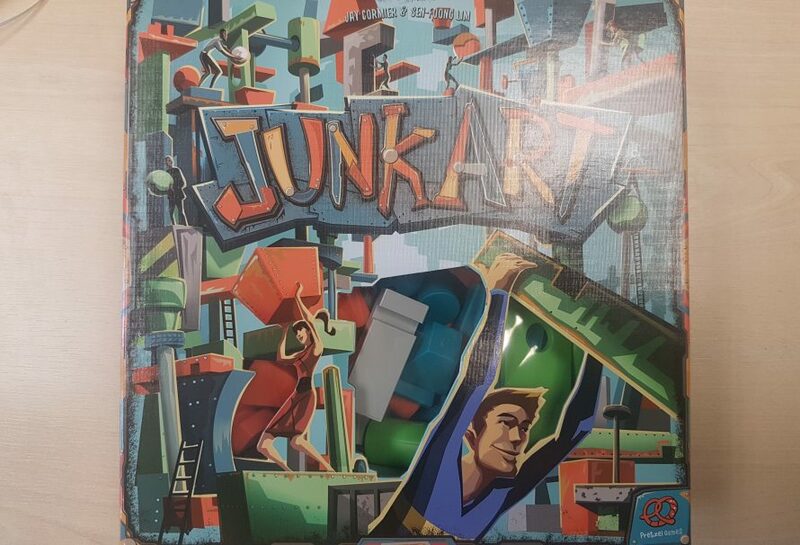 Junk Art was first released last year, 2016, bringing its unique gameplay to board gamers’ tables. The components were wooden in the original, which some had complained warped over time and extensive use. Junk Art has now been re-released with plastic components and it is this new version this review will focus on. The box is full with 60 odd, peculiar shapes, split equally into 4 coloured sets, ready to be balanced and tumble over. However, is Junk Art balanced brilliance or is it just junk? Let’s find out! As the base rules go there isn’t exactly many. As a basis for a standard game the rules state that everyone gets a starting base. Next, the odd colourful shapes are piled up in the middle of the table, within reach of everyone. Finally, when placing pieces of junk players are unable to touch/move previously placed pieces on their structure with their hands. Players will be glad to know that prodding with new junk piece is perfectly within the rules, just no hands! General concepts are there, such as parts falling off, but the rest is dependent on the city card in play. The cities cards are used to give variations to the basic rules of Junk Art, give victory conditions and almost more importantly set the parameters of how to lose or get eliminated from the round. Some cities represent minor tweaks from others with a limit to the number of pieces falling. On the other hand, a few completely change the way the game is played. Montreal for instance has players actively changing places around the table periodically, certainly a more active game than the norm. My current favourite has been the city of Paris. Unlike other cities, aside from Pisa, players put aside their individual player bases, replacing them with a single central base. Players still have the standard bits falling off the structure limit but as it’s not just you building the structure you never know quite want you’ll be balancing on next. This shakes things up with players often going for more riskier balancing of pieces in a hope of making things a lot harder for a subsequent player. 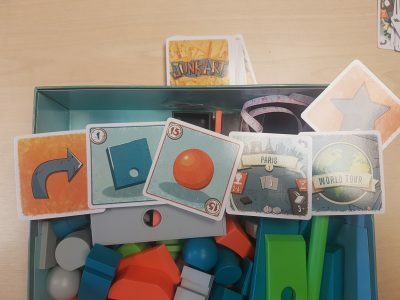 These unique rulesets help add replayability into the game and will guarantee, to some extent, the longevity of Junk Art’s gaming shelf position. Spare city cards are even included to allow players to create and note down their own wacky rulesets. While each of the cities are playable with the player count range of 2 – 6 there are some which significantly benefit from either higher or lower player counts. The city of Paris as mentioned above uses one central base which is perfect for when the player count is at max. One central structure helps to keep players engaged even when it isn’t their turn. Conversely, this is also the case for cities where players must simultaneously do actions. When there is a turn order and players go one at a time the downtime can occasionally slow the pace of the game down with lots of players. Even then things don’t get slow enough for lulls in the balancing action. Alongside the tweaking of rules comes different win conditions. Monaco and Indianapolis both offer bonus points for the tallest structure making players have multiple objectives. Some of these scorings seem to suit lower player counts, with everyone bar the loser gaining points. This can feel a bit of a victimisation exercise when 5 players gain points but the one “loser” doesn’t. This just seems slightly outside of the fun natured, light-hearted gameplay that Junk Art promotes. 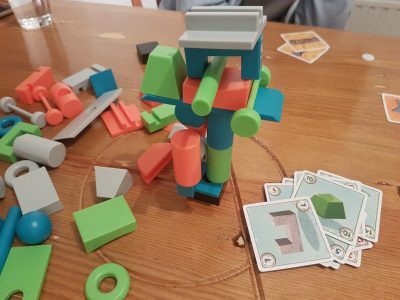 The big change for this release is that the game pieces that you’ll be balancing and making structures from are plastic. This should substantially increase the durability of the pieces, avoiding the warping issues experienced by some owning the wooden edition. Wood vs. plastic is naturally a personal opinion. Material preferences aside, the gameplay is completely the same. The best bit for gamers is that it seems this new version will be a good amount cheaper than the wooden version. Making it more affordable, enabling more to get in on the experience. For gamers whom already own Flick ‘em Up there is a special city (Nashville), kind of like a mini expansion, included just for you. While I don’t personally fall into this category, leaving a few cards in the box currently useless to me, I do enjoy the concept. Pretzel Games have clearly used this as a way of rewarding loyal customers and at the end of the day it would have to come in one of the game boxes so why not this one? The closest comparison to more mainstream games I can fathom is the latter part of a Jenga game. Feelings of panic and tension when placing a removed brick onto of the wobbly structure is the feeling that Junk Art is built upon and it thrives as a result. 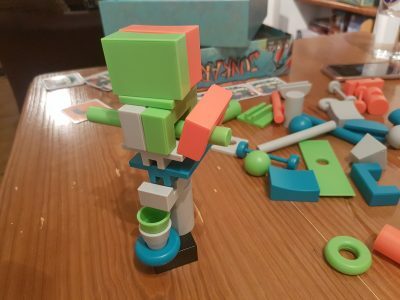 Feelings of being unsure whether a crazy balance of this random odd shape, rather than perfect cuboids, will pay off, resulting in you surviving another turn, flow through the game. They will affect each and every player turning normally steady hands into shaking and praying hands. 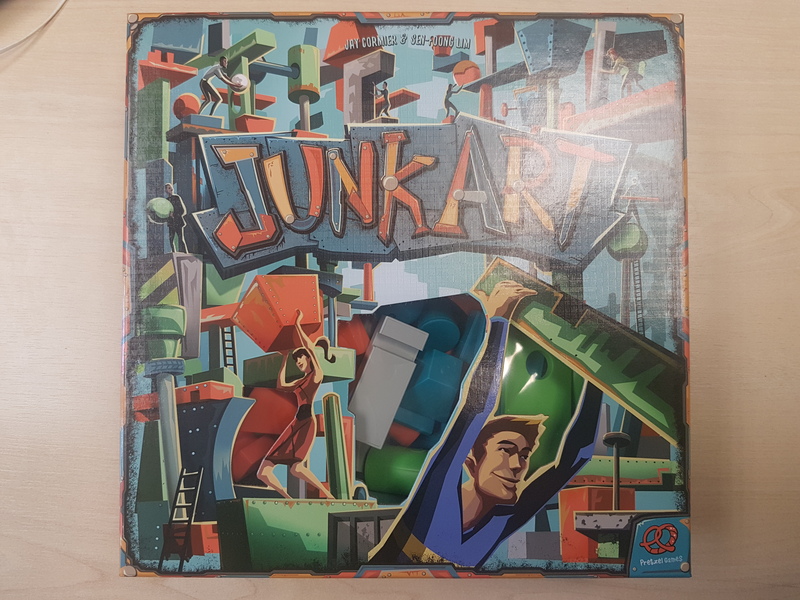 Junk Art truly captures this tension and builds a must-experience game around it. Junk Art has, in no time at all, become one of my go to gathering/party games to grab down off the shelf and get to the table. Whether drink is involved or not Junk Art manages to guarantee laughs, pointing, exclaiming and a few good clattering of pieces bouncing across the table. You’ll see friends and family members begging others not to receive specific shapes, whilst carefully deciding how to best screw over the next player. Fun is well and truly at the core of Junk Art and there nothing to stop people playing! The simplicity of the rules enables anyone to intuitively pick up the game and play from the get go so you have no excuse for not, at the very least, trying Junk Art at your local board game café.